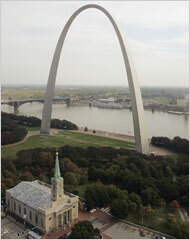 What to Do with Gateway Arch Grounds? The St. Louis Gateway Arch and grounds sits along the Mississippi River but separated from downtown St. Louis by a sunken freeway. The New York Times reported earlier this month about how the grounds are at the center of a dispute between a group of prominent residents who want to develop parts of the park, including construction of a cultural attraction, most likely a museum, and the National Park Service, which administers the site and is cool to some of the group’s proposals. The dispute raises issues about preservation versus change, local versus National Park Service control of an urban park that is both city park and nationally significant, and possible precedent for other parks in the National Park Service, particularly those in urban areas.